I recently showed how to install Ubuntu 14.04 Server edition. At least, couple of readers wanted to know how to install Ubuntu Server from USB. Ubuntu USB install is very simple but a lot of Linux newbies do not know how to do this. In fact, my Intel Atom based home server does not come with an optical drive and install Ubuntu from USB is the only way to do it. 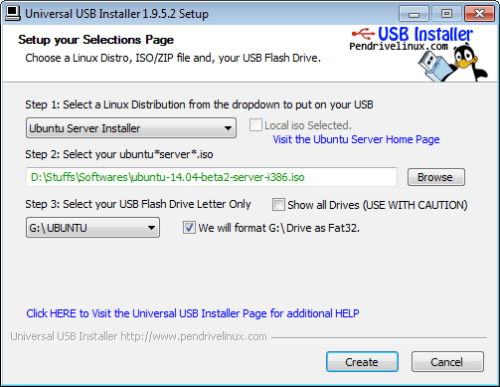 In this post, I am going to show you how to install Ubuntu Server from USB stick in just a few simple steps. Download the latest .iso of whatever Ubuntu flavor you want to install from here. A compatible USB stick with at least 2 GB of space. If you do not want to download, write, and install Ubuntu Server from USB that you have around, you may purchase a USB drive that is preloaded with Ubuntu. Personally, I think preloaded bootable Ubuntu USB drives are not worth the money. 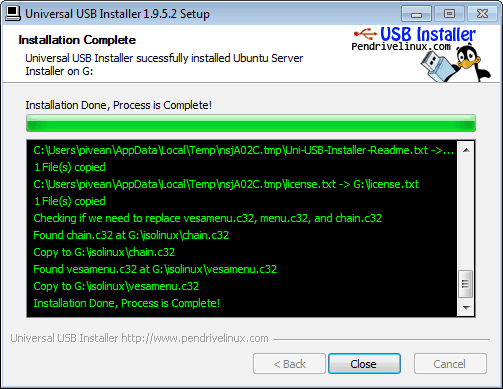 It is a lot easier and cheaper write your own bootable USB installer. Step 3: Select the drive corresponding to the USB drive. Exercise caution and select the correct drive as the drive will be modified and you may lose its contents. Also check the format drive checkbox if your USB drive is not already formatted to FAT32. Finally hit “Create” and wait for the process to complete creating Ubuntu live USB. Start the Ubuntu Server USB install process by booting your computer from the Ubuntu Server live USB. How you reach the boot options screen varies with the manufacturer and model of the computer. Generally you might have to hit Esc key, Del key, or one of the function keys. Once you are in boot options choose to boot from the USB drive and continue with Ubuntu installation by following on screen instructions. From here on, the process is the same as installing Ubuntu Server from the CD. You may follow my other guide on how to install Ubuntu server or you could watch my video tutorial listed below. How to install Ubuntu Server 14.04 Trusty Tahr? So if you do not have a CD drive, don't worry, just create a Ubuntu Live USB and install Ubuntu Server from USB. Have fun! Video: How to install Ubuntu Server 14.04 Trusty Tahr? How to properly uninstall SickRage on Ubuntu Linux? How to reset Glype admin password?